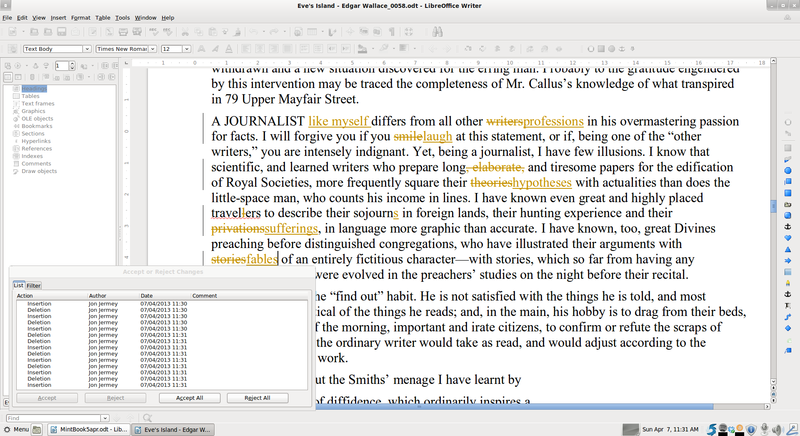 LibreOffice Writer is modelled on Microsoft Word, but with some omissions and a few useful additions. You will find the default menus and toolbars very similar to those in Word, although a Navigator window is used in place of the ‘Go To’ options in the Edit menu. The main menu is exactly the same and the Standard and Formatting toolbars contain most of the same buttons as their Word equivalents. The first important differences appear in the View toolbar, where the Normal and Outline views are both missing. There are two ways to view a document in Writer: Print Layout, where the edges of the page and the print margins are displayed; and Web Layout, which displays a full screen-width of text. There is no Outline view as in Word. Writing text is straightforward. Unrecognised words appear with a wavy red underline, and right-clicking on them brings up an option to correct them or to add them to a dictionary of your choice. New dictionaries can be added to the list by selecting ‘Spelling and Grammar’ and then ‘Options’. There is a thesaurus tool and some basic grammar checking. An optional autocorrect feature picks up common errors like ‘teh’, and a tip feature alerts you via an icon in the corner of the screen when autocorrect or other automatic changes are triggered. Smart quotes and automatic hyperlinking are supported. Format/AutoCorrect/AutoCorrect Options allow you to specify what errors are to be fixed while typing, and controls options like the automatic formatting of list items. Writer can be set to automatically save a document at specified intervals. Selection by clicking works as follows: double-click for a word, triple-click for a sentence and quadruple-click for a paragraph. To select the whole document, use Ctrl-A. Ctrl-Up and Ctrl-Down move the cursor one paragraph at a time. Cursor movement can be combined with Shift to select blocks of text. Drag-and-drop editing works, but Writer doesn’t always add back in the correct number of spaces between words and after punctuation. A Navigator panel can switched on via the View menu. This shows various ways of dividing up the document – by headings, sections, the locations of bookmarks, etc – and allows the user to go straight to any of these items by double-clicking. The same functionality is available via the three buttons as the bottom of the right-hand scroll bar: the middle button brings up a pictorial menu of item types, and the arrow buttons above and below step through the document item by item. Spell checking works in the same way as Word but a much larger range of alternative spellings is usually displayed. It is easier to add and use custom dictionaries than in Word. A Thesaurus is built in: highlight a word and select ‘Tools/Language/Thesaurus’ or simply press Ctrl-F7 to list synonyms. If you start typing a long word Writer will suggest the ending, and if it is correct you can accept this with a single keystroke; so typing ‘repositories’, for instance, only requires six keystrokes. This is a dynamic feature, and over time Writer will learn to autocomplete the longer words that you commonly use. Formatting works as expected. The Format menu has options for characters, paragraphs, bullet lists and pages. Text can be highlighted in a wide range of colours. Users can define styles for characters and paragraphs using Format/Styles and Formatting. These are less complex and versatile than those in recent versions of Word, but probably easier to use for beginners. Styles are grouped into categories for paragraphs, characters, pages, frames and lists. Once a style has been defined or modified in one document, that document can be saved as a template using File/Save As, and new documents based on that document will have access to that style. Alternately, you can use File/Templates/Organize to open up a list of modified styles in one document and move (drag) or copy (Ctrl-drag) them to another. 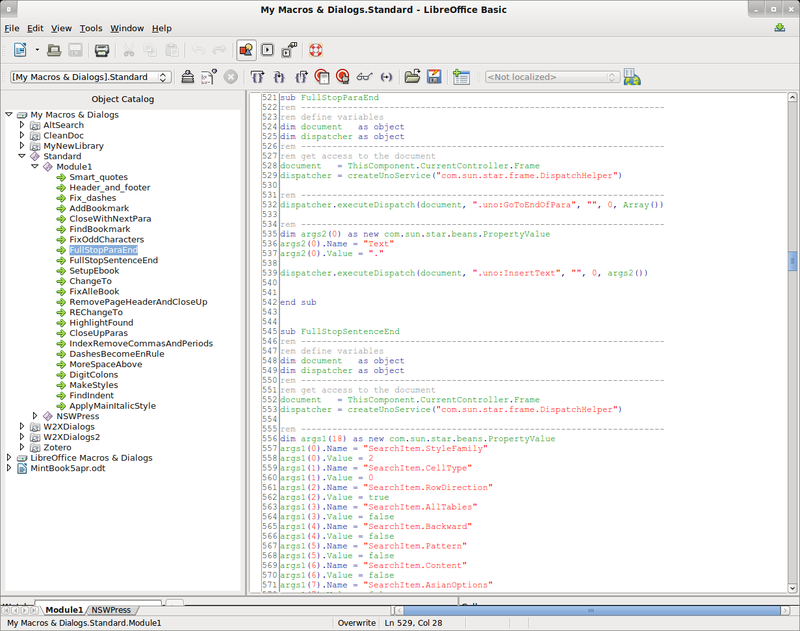 The location of template files can specified for all LibreOffice modules under Tools/Options/LibreOffice/Paths. Placing them in the <username> directory ensures that they will get backed up along with other documents and data. To open a new document from a template, use File/New and select ‘Templates and Documents’ from the bottom of the submenu. Search and Replace allows searching for formats and paragraph attributes, and supports a powerful ‘regular expression’ searching feature, originally developed for Unix. This allows you to search for, say, every paragraph beginning with ‘But’ and including the words ‘Kate’ or ‘Kathie’ or ‘Katherine’.
. Represents any single character except for a line break or paragraph break. For example, the search term “sh.rt” returns both “shirt” and “short”. ^ Only finds the search term if the term is at the beginning of a paragraph. Special objects such as empty fields or character-anchored frames, at the beginning of a paragraph are ignored. Example: “^Peter”. $ Only finds the search term if the term appears at the end of a paragraph. Special objects such as empty fields or character-anchored frames at the end of a paragraph are ignored. Example: “Peter$”. * Finds zero or more of the characters in front of the “*”. For example, “Ab*c” finds “Ac”, “Abc”, “Abbc”, “Abbbc”, and so on. + Finds one or more of the characters in front of the “+”. For example, “AX.+4” finds “AXx4”, but not “AX4”.The longest possible string that matches this search pattern in a paragraph is always found. If the paragraph contains the string “AX 4 AX4”, the entire passage is highlighted.
? Finds zero or one of the characters in front of the “?”. For example, “Texts?” finds “Text” and “Texts” and “x(ab|c)?y” finds “xy”, “xaby”, or “xcy”. \ Search interprets the special character that follows the “\” as a normal character and not as a regular expression (except for the combinations \n, \t, \>, and \<). For example, “tree\.” finds “tree.”, not “treed” or “trees”. These are taken from the complete list on the LibreOffice help site at https://help.libreoffice.org/Common/List_of_Regular_Expressions. The File menu includes a Page Preview option. The Writer Print dialog is fairly basic but it includes a LibreWriter tab with the option to turn off the printing of graphics and background colours, providing the equivalent of a draft mode. Writer supports both versioning and document comparison. With versioning turned on in the File menu, you can choose to save and retain any version of your document as it goes through the editing process. Any two versions can then be compared, to identify and review exactly what changes have been made. The same process can be used to compare two separate documents – e.g. when the same set of data has been typed in twice by two different operators. Document review is available, as is versioning, and two documents or two versions of the same document can be compared. Tracking of changes as they occur is supported, and there is a Review toolbar which allows you to view the changes and decide whether to accept or reject them. You can insert tables into Writer documents using the Table menu or the Insert menu. Tables can be formatted, with control over the thickness of borders, etc, and sorted into order by any column. There is a formula builder which allows you to add formulas to the table which will automatically calculate results – e.g. totals and averages. Updating the figures in the table will cause the results to be recalculated. Writer supports Bookmarks (named positions in the document) and comments. These can be added via the Insert menu. The Navigator allows you to browse through comments and bookmarks, as does the Browse button at the bottom of the right scrollbar. Text and graphics frames can be inserted and given captions with automatic numbering via Insert Fields. Other available fields include page numbers, date, and document information like the word count, file name and page length. Fields are updated automatically when the document is saved. Writer can add footnotes and/or endnotes, and create a table of contents from headings and an index from highlighted terms in the document. These are dynamic fields which will update automatically when other footnotes are added or removed. Like Word, Writer can be extensively customised via the Tools/Options dialog box settings. Advanced users can create their own menus and icons associated with particular commands. Users can also define their own keyboard shortcuts through Tools/Customize, overwriting the default settings if necessary. The Help system for Writer is comprehensive but not very user-friendly. Most users will have more success with online searching, starting with the addresses given at the beginning of this document.